There’s got to be a morning after…. While the eighth and final issue of the phenomenal House of M series (Final Thoughts) acted as the falling action/epilogue issue, the dramatic shift in the universe required an entire massive stand alone issue. The aftermath of the Scarlet Witch’s “No More Mutants” decree became known as Decimation. Most of the world’s mutant population suddenly woke up no longer mutants, and this has far-reaching implications beyond just a few depowered heroes and villains (Blob’s piles of flesh is a grotesque and clever way of showing how some former mutants will have to cope). Entire political parties and organizations crumble, and waves of violence threaten every corner of the world as both former mutants lash out and pro-humans see it as a reckoning to end mutants once and for all. 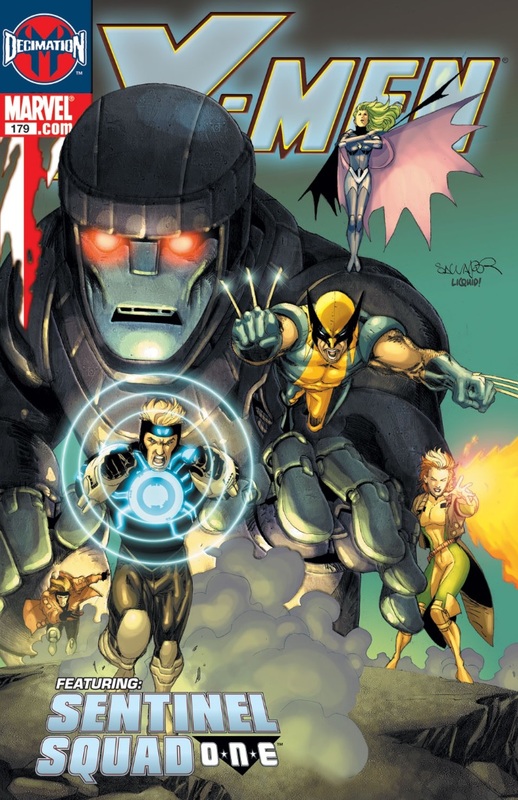 Functionally the massive one-shot Decimation issue sets up several mini-series centered around the X-Men in the coming months, as well as the story-lines and situations directly affecting the other main X-Men series (save for Whedon’s Astonishing X-Men, which glaringly doesn’t care a fig about what else is happening). Decimation introduces Generation M, Sentinel Squad O*N*E, The 198, Son of M, X-Factor and eventually Deadly Genesis. I read a few of them and will feature each one in its own Final Thoughts (Each are 5-issue limited series, with the exception of X-Factor which becomes an incredibly successful series on its own). As a lead in to those various story-lines and the state of the world (specifically Xavier’s Mansion), Decimation is essential, though not all that great on its own. Cyclops offers sanctuary to every remaining mutant, and the newly appointed Sentinel Squad (sentinels piloted by people) arrive to help out and protect everyone inside the makeshift refugee camp that’s set up right outside the mansion (further told in The 198). The actual trade paperback also includes issues #177-181 of the ongoing X-Men series. 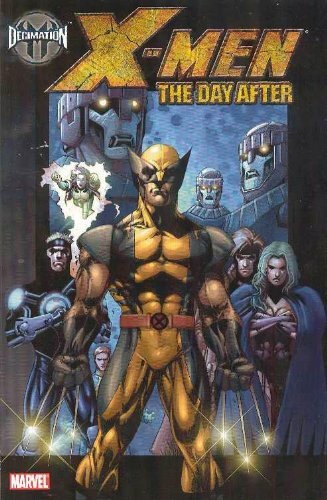 As I mentioned back in my Astonishing X-Men Final Thoughts, my favorite mutants were split up into three ongoing series back in 2004. Just plain X-Men was compromised of Iceman, Havok, Polaris, Rogue, Gambit and of course Wolverine (who’s in every team and also an Avenger. It’s kind of an old joke by now). Issue #177 picks up directly after the Decimation one-shot, and has the team fighting off the newly arrived sentinels before realizing they’re technically here to help (at least half of all comic book fights are simple misunderstandings). The three-issue story arc, “House Arrest,” quickly ‘fixes’ Iceman’s supposed de-powering by making it all in his head, whereas Polaris is one of the few X-Men to have legitimately lost hers. The issues are a sporadic mess as Claremont is setting up multiple spinning plates on top of a rocky foundation. There’s the Blood of Apocalypse tease, the O*N*E introductions, the Sapien league villains and a super dumb side story where Polaris and Havok quit the team (the two-issue “What Lorna Saw” arc in #180-181). I also vehemently can’t stand Salvador Larroca’s art work. I can handle a more cartoon-y, crisper art style (though I definitely prefer darker and more grizzled looks on my heroes) but Larroca’s borderline anime style irks me in all the wrong ways, and honestly just destroys my ability to enjoy the series. I can usually enjoy various artists’ interpretations of characters and style but I officially met my limits with the X-Men series. House of M essentially did to the X-Men what Avengers Disassembled did to the Avengers – change their dynamic and situation for years to come. Decimation provides a useful introduction to all the spiffy new mini-series that are created in the aftermath, but X-Men really drops the ball in offering a satisfying new angle. X-Men lasted another 25 issues so I’ll probably check back with it for the major storylines (Blood of Apocalypse and Messiah Complex), but I’ll stick to Uncanny X-Men and Astonishing X-Men to get my mutant fill.